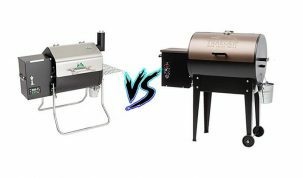 Electric smokers are a great option for people looking to get into smoking meat but who don’t want to have to worry about constantly tending to a smoker. They require minimal assembly, barely any smoking knowledge and allow you to get on with the rest of your day whilst your food smokes. 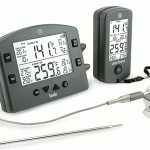 In our Bradley smoker review we’ll take you through everything you need to know about a Bradley Digital Smoker and help you decide if it’s the smoker for you. Bradley have a large range of smokers. They initially started out with basic electric smokers, the Original Bradley Smokers. But soon moved onto digital ones, like the one we’re reviewing today. They’ve even release a smart smoker that can be fully controlled wirelessly through a smart device. 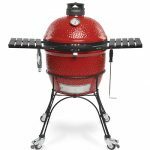 This made it onto our list of best electric smokers as we were very impressed with the overall taste and intrigued by the smart features. We’re reviewing the 4-rack digital model. This is a mid range model that has become very popular and is one of their best selling products. The main smoking chamber with enough room for 4 adjustable racks. A drip bowl for catching the wooden bisquettes. A tray to protect the base of the unit from spills and drips. Drip tray to funnel juices. Digital smoke generator that controls the temperatures and the acts as a hopper to the wood bisquettes. Owner’s manual and recipe book. Power cords and sensor cables. 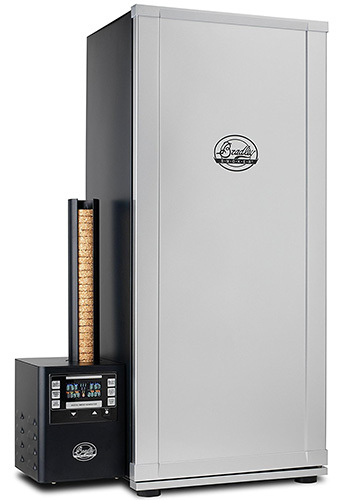 The Bradley 4-Rack Digital Smoker also comes with a 1 year warranty. 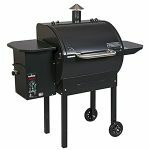 The main design feature that differentiates the Bradley Digital Smokers from any other electric smoker is their ability to create a lot of smoke completely automatically. 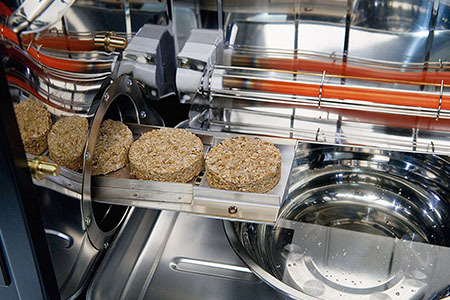 To do this a digital controller is used to set and measure the times and temperatures of the main cooking chamber and then at certain points the built in hopper will release a wooden bisquette into the burning area. This is heated by a dedicated burner and is what causes the smoke. It is then automatically pushed into the bowl when it has been burned enough and a new one takes its place. This is a very interesting design that generally works very well. It allows you to leave it alone completely for up to 8 hours. This level of automation is only matched by pellet smokers, that work in a very similar way. But what is best about this technological way of smoking is that you get a huge amount of control over how the smoker works. 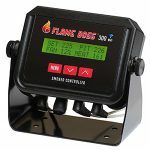 You can set the time, temperature and smoke levels to get a very precise smoke. Or just keep it simple if you just want it to do all the hard work if you’re feeling lazy. The rest of the smoker is also very well designed. It looks good and the removable racks are nice. So, it’s well designed, but how does it fair when it comes to build quality? The main chamber of the smoker feels solid and has a nice finish. 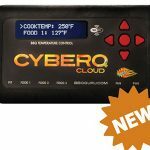 It has an insulated steel interior that makes it very capable of cooking on hot or cold days because the heat retention in the chamber is so good. It also allows for easy clean-up. The quality of the digital controller is where most people have problems. The design of the interface is okay, but some can find it confusing. The accuracy and quality of the digital controller is where most complaints come from. Several people have reported that the temperatures measured with the controller are up to 40 degrees out and others have reported that the electronics have failed after a while. We haven’t personally experienced any problems so we can’t comment on that. Remember there is a one year warranty to get your money back if you’re worried about these problems. The assembly of the Bradley electric smoker is very simple. The instructions are good and everything is fairly self explanatory. It will take you around 5 to 10 minutes from opening the box to having a working smoker. The interface on the digital controller is quite clear and intuitive to use. It’ll take a few minutes to learn what’s going on with all the buttons but after a while you should be able to use it easily. The best part of the Bradley digital smoker, though, is how easy it is to use once you’ve got it going. There is very little to do once it starts smoking and many times you’ll never have to check it until it’s done. This is a massive plus point for the Bradley as other electric smokers require you to at least add wood chips during the cook. 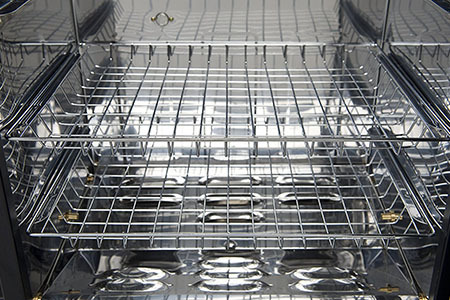 Others require damper control to regulate airflow and temperature. But this literally will do everything itself. 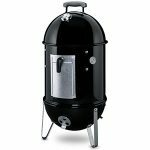 Like most electric smokers, the Bradley Digital 4-Rack Smoker makes smoking incredibly accessible. You could buy it today with a packet of wood bisquettes, having never smoked meat before, and within a few minutes you could be cooking your first brisket. It is fully automated. Some electric smokers, such as the Masterbuilt range of smokers, require you to periodically refill the wood chip tray to keep the smoke consistent. But the automatic hopper and the bisquettes create a great way to take all the effort out of smoking and means you never need to worry about smoke generation. The Bradley smokers generally produce some of the best results out of all the electric smokers we’ve tried. 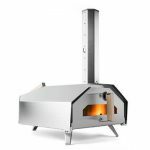 We love that it has a dedicated electric heating element for heating the wood. This gives you a lot of control of the amount of smoke it can produce. This is a great feature and helps to produce proper smoky flavors. 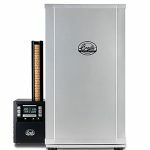 The Bradley Digital Smoker has a large variety of food that it can cook. With a cold smoker accessory it’s easy to smoke cheese or anything else that requires much lower temperatures. 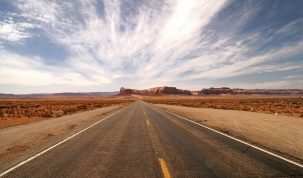 It can also reach higher temperatures with a maximum of around 320°F. This gives you a lot of option for shorter smokes. A lot of other electric smokers can’t manage this high of a temperature. 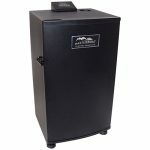 If you live in an apartment complex (or anywhere) where you can’t have a charcoal smoker then an electric smoker is an ideal alternative. The price of the Bradley Digital 4-Rack Electric Smoker is quite reasonable. 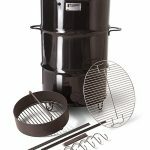 For less than $400 you can get the smoker and some wood bisquettes. This is much cheaper that equivalent pellet smokers. As electric smokers tend to be vertical you generally get a good amount of cooking area. At 572 square inches, the Bradley 4-Rack Smoker give you plenty. Enough for 4 full racks of ribs. There is a nice range of bisquettes that can really help add an extra layer of flavor. Read through our ultimate guide to smoking with wood to give you an idea of which wood works with which food. If you’re looking for a good all-round bisquette, then we’d recommend the hickory flavor bisquettes. The worst thing about the Bradley Digital Smoker is the potentially unreliable digital controller. 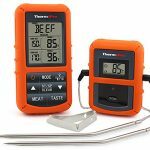 We’d recommend using a dedicated digital thermometer to measure the temperature of your food to make sure that you take it out at the ideal time. It sometimes produces too much smoke. There have been reports of some people getting quite bitter results because of the amount of smoke that it produces. Here’s a product that can help to reduce the amount of smoke that is created. They’ll help save you bisquettes, which saves you money. You won’t get that classic BBQ smoke ring. Or at least not like you would if you used a charcoal or pellet smoker. If you’re going for quality of the food over ease of use then we’d recommend a charcoal smoker. 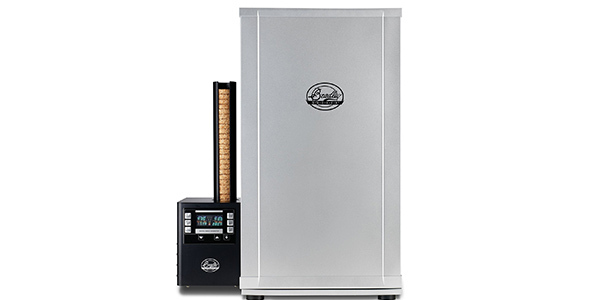 If you’re looking for the best of both worlds, then definitely look into picking up a pellet smoker. Overall, the Bradley Digital Smoker is a very good product that can produce some of the best tasting BBQ in the easiest possible way. If that’s what you’re looking for then the this is well worth the price and we’d highly recommend it. If you’re looking for a cheap smoker to start you out on your smoking journey, then we’d recommend reading our review of the Masterbuilt 30 Inch Electric Smoker as that may be a better fit. There are a range of accessories for Bradley Digital Smokers. Here’s a few of our favorites. 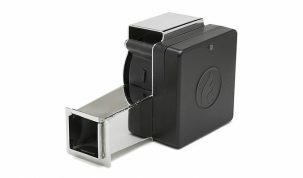 Bradley Cold Smoker Adapter – This allows you to use your Bradley smoker as a cold smoker. It’s easy to install and produces very good results. Great for smoking cheese and fish. Smoker Cover – We’d generally recommend picking up a smoker cover for any smoker purchase and this is the one made by Bradley themselves. If you’re looking for more information check out our How to use an Electric Smoker – In 6 Easy Steps guide. Bradley have a huge range of recipes available on their website. There’s all the classic BBQ favorites to more adventurous desserts and sauces. Here’s a video showing you how easy it is to set up your new Bradley Digital Smoker. The one in the video is the 6-Rack, but they are virtually the same.